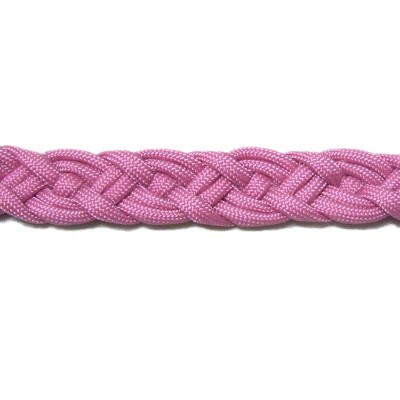 Description: The Celtic Bar is very similar to the Snake Braid, where you cross and weave the cords to create the woven appearance. 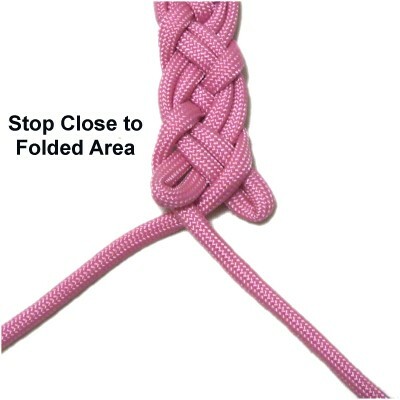 Two folded areas are combined with the working ends to form the braid, so there are a total of six segments. You can use six separate cords to make this design, if you prefer not to fold the cords. This design can also be started at the center working in both directions towards the ends. 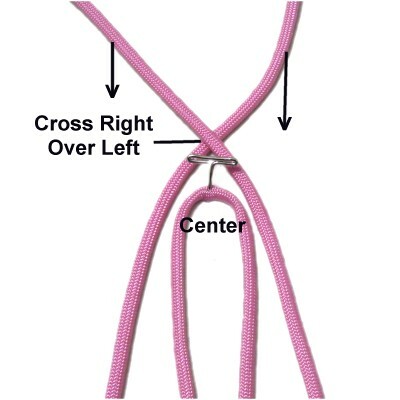 You can use this knotting technique for straps, bracelets, choker necklaces, dog collars and leashes, belts, and more. 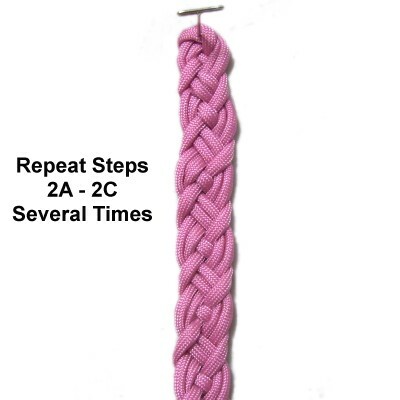 2018 Update: I've changed the way the steps are described, so this pattern makes more sense if using 6 separate cords. Contact me if you need the original page. Click on the image or link to visit his site. 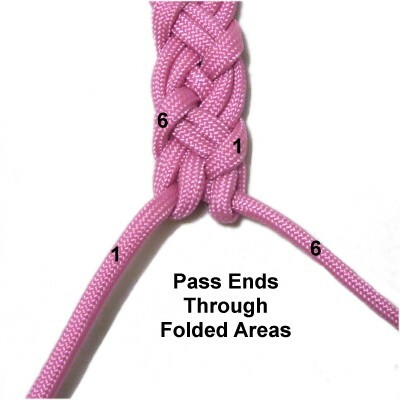 The video gallery contains a wide variety of tutorials for combination knots and techniques. Preparation: To practice, you need one cord at least 60 inches long. The cord should be at least 9 x the finished length you plan to make if you are using the Celtic Bar for a Macrame project. 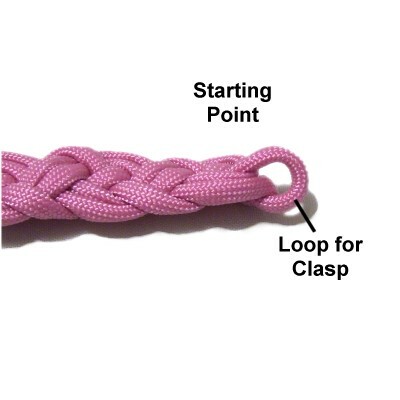 Increase the length if you are making a clasp. 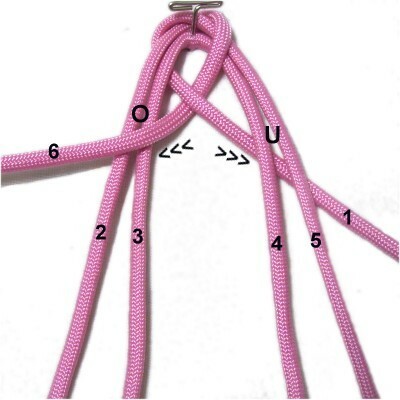 Step 1: Fold the cord in half and secure the center of it to your board. Measure from the center (forward) to the finished length you plan to make. 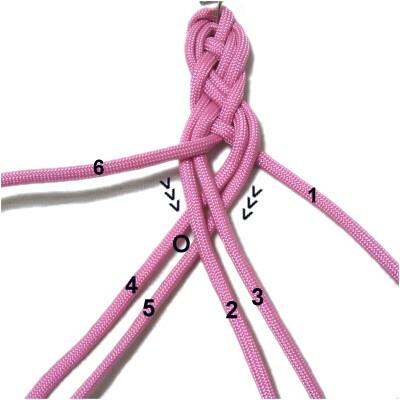 Fold both halves at that point, then bring them back towards the center of the cord. Cross the two halves right over left, close to the center of the cord. Then bring them forward on either side of the folded portion. You should now have six segments to make the Celtic Bar. Step 1, continued: Mentally number the six segments starting on the left. Segments 2 and 3 work together, as do segments 4 and 5. They lead to the folds in this design, which makes them easy to identify. When using six separate cords, it's helpful to keep the two pairs together with tape. 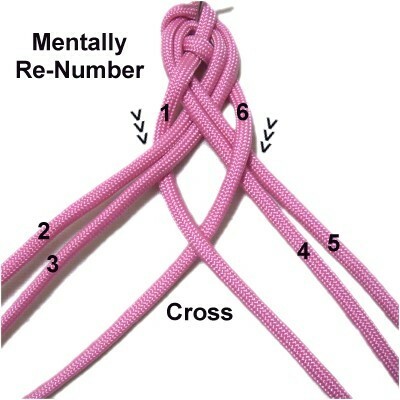 Segments 1 and 6 lead to the ends of the cord. Step 2A: Move segment 6 over segments 4 and 5 diagonally, heading left (inward). Move segment 1 under segments 2 and 3 diagonally, heading right. Cross segment 1 over 6. Step 2B: Move segment 6 over segments 2 and 3, heading left (outward). Move segment 1 under segments 4 and 5, heading right. Step 2C: Cross segments 2 - 3 over segments 4 - 5. Arrange both pairs diagonally as shown. Tighten this area so it rests close to segments 1 and 6. Step 3: Mentally re-number the six segments. The portions that lead to the ends are segments 1 and 6. Step 4: Repeat step 2B. Step 5: Repeat step 2C. Step 6: Repeat steps 2A - 2C several times, tightening as you progress. 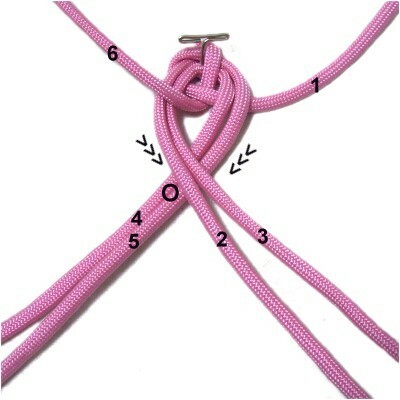 Step 7: Stop on step 2A, making sure you are very close to the folded areas of the cord. Try tightening the Celtic Bar a bit more if you are finding it difficult to stop on that step. 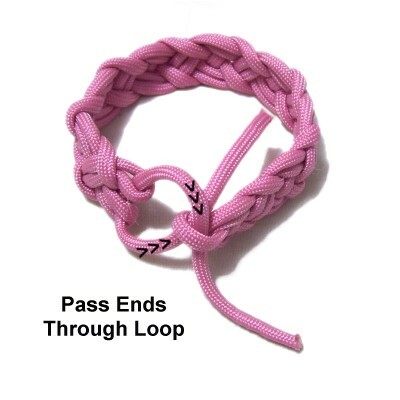 Step 8: Pass the ends through the folded area, which look like two loops. Make sure segment 6 passes through the right loop and segment 1 through the left (both from below). Step 9: This step is optional. 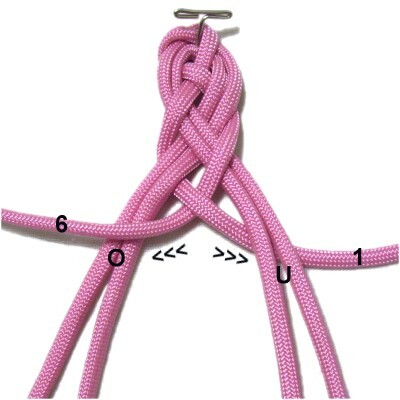 Go back to the starting point and pull one segment to create a loop if you need a clasp. 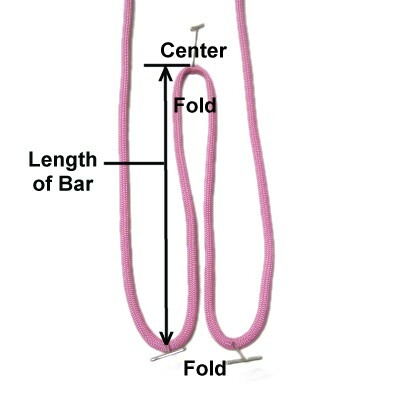 To form a closure or clasp for your Celtic Bar, pass the ends through the loop in opposite directions. 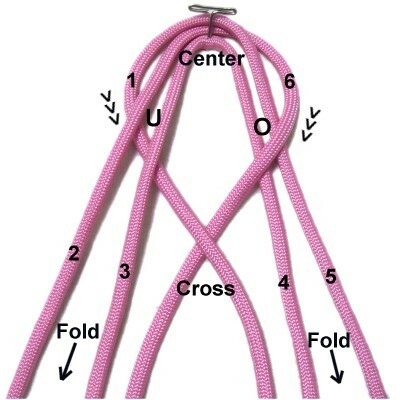 Tie finishing knots and/or apply beads at the tips to prevent the ends from sliding out of the loop. Have any comments about the Celtic Bar? Contact Me.